Once a waterjet starts to move out of the nozzle with any significant speed, as the pump pressure begins to build, it becomes more and more difficult to look at the stream of water and get any realistic idea of its structure. Mainly what is seen is the very fine mist that surrounds the main body of the jet, and while some idea of the structure can be obtained by making cuts through material, it can be quite expensive to actually see within that structure. Part of the problem is that though the mist is very fine, it is also moving at speeds in the range of a couple of thousand feet per second. The human eyeball isn’t quite that fast. But we can use a very high-speed flash (in this case it was on for two millionths of a second) which has the effect of “freezing” the motion. Figure 1. 40,000 psi jet issuing from a 0.005 inch diameter orifice, front lit. However this mist still hides the solid internal structure of the jet and does not change much in relative structure, even when the internal jet conditions can be quite different. Fundamentally the internal structure was described by Yanaida at the 1974 BHR Group Waterjet Conference, and his description has been validated by many studies since. This structure holds for jets across a wide range of pressure and flow volumes, but it is difficult to determine the exact transition points of that structure conventionally. And this can lead to very unfortunate results. I have twice seen people back a nozzle away and then move their hand in front of the jet to show that even high-pressure jets (these were being used to cut paper products and had no abrasive in them at the time) could be “safe.” If both cases the individuals were very lucky to escape injury (water can penetrate the pores of the skin and lacerate the internal parts without any surficial signs of injury, and, as I showed last time, if the nozzle is too close it will slice through flesh and bone). I thought to take today’s post to show, though the use of photographs, why that was such a stupid action. 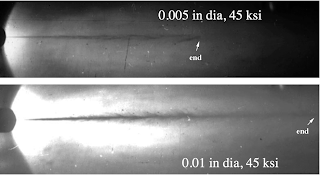 The photos were taken down at Baxter Springs, KS in the early 1970’s and involved the use of what was then a MacCartney Manufacturing Co intensifier, to shoot jets of varying pressure, and nozzle diameter along a path, so that we could see how coherent the jets were. As I mentioned above, the problem with looking directly at the jet is that the internal structure is hidden by the surrounding mist. To overcome that part of the problem we shone the light along a ground glass screen (to diffuse it) that was placed behind the jet, so that we could see the outline of the internal structure. Figure 3. Arrangement for taking photographs of a high-speed jet. This more of the downstream mist from the photograph, and a much better idea of the internal structure of the jet, and where the solid section ended could be measured. Figure 4. Backlit, 30,000 psi jet issuing from a 0.01 inch diameter nozzle, the distance across the photograph is 6 inches. The benefit of the technique is perhaps more evident when nozzles at different pressures and diameters and different chemistry are compared. First consider the change with an increase in jet diameter. From the front-lit view there is little difference in the jets. From the backlit, it is clear that the smaller diameter jet only reaches 3-inches across the screen, while the larger jet barely reaches the end of the range. Figure 5. The effect of doubling the orifice diameter at the same jet pressure on jet range, the photo length is 6 inches. 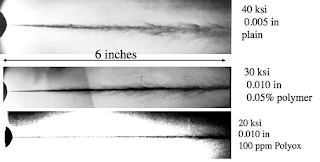 One of the parts of the study we were carrying out in 1974 was to examine the effect that adding different long-chain polymers had on jet structure. The ones that we were looking at include some that are now used in the oil and natural gas industry to make the “slick water” that is used in the fracking industry to improve production from shale reservoirs. But it also has an advantage in “binding” the jet together. And so, in the study, Dr. Jack Zakin and I tested a wide range of different polymers to see which would be give the best jet. There were a number of different things we were looking for. In cutting paper, soft tissue and water sensitive material for example, the polymer can bind the water sufficiently well as to further lower wetting to the point where it doesn’t have an effect. It also can improve jet cutting under water – but I’ll cover those in a few post on polymer effects that will come to later in the series. The effect of a polymer (in this case an AP273) is shown in two tests where the only change was to add the polymer to the water for the lower one. Figure 6. Jets with an orifice diameter of 0.01 inches at a pressure of 20,000 psi, the range is 6 inches, and the lower jet has had the polymer AP273 added to the water. Figure 7. The effect of changing jet pressure, nozzle diameter and polymer content on jet cohesion. It might be noted that the jet in the bottom frame has as much relative concentration (and power) at the end of the range as the top jet had at the beginning of the range. Now it all depends on what you want the jet to do, as to which condition you wish to achieve. Inside abrasive mixing chambers the object is much different than it is when the object is to cut a foot or more of foam with high quality edges. And there have been some interesting developments with different polymers over the years, but I’ll save those stories for another day. But bear in mind that those individuals who could slide their fingers under the jet in the top frame of figure 7 would have had them all cut off if the jet had been running instead under the conditions of the bottom two frames, and in all three cases, to the naked eye the jets looked the same.